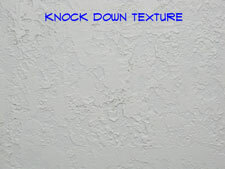 Knock down texture as the name implies is done by knocking down the stipples. Follow the instructions for a 'Stipple Drywall Texture' that is discussed in step one. This will give you an area textured with a stipple pattern. You will have to go through the experimenting phase to come up with something that looks similar to what you have. Let the texture start to dry. You are trying to get the classic flattened look that is the trademark of a knock down drywall texture. Even among professionals, keeping a consistent look is difficult. Use a plastic trowel or a piece of stiff but pliable rubber to 'knock down' the stipples. You want the trowel to ride lightly over the surface. Do not push it tight to the drywall. Apply enough pressure to get a knock down look similar to the surrounding area. Step back and give it an inspection. Not satisfied? Scrape it off and try again. Looks good? Great, your texturing drywall experience has been pleasant. Now you can move onto other repairs in your home. For more information on drywall texture, see the articles 'How To Repair Drywall Texture' and 'Patching and Repairing Drywall'.